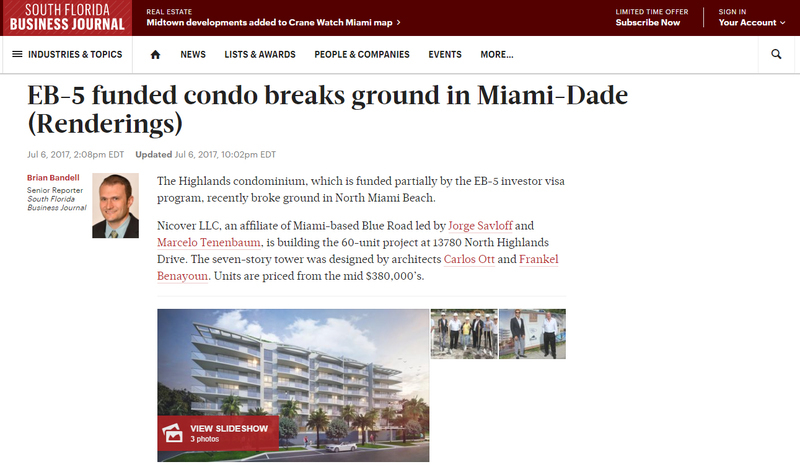 The Highlands condominium, which is funded partially by the EB-5 investor visa program, recently broke ground in North Miami Beach. Nicover LLC, an affiliate of Miami-based Blue Road led by Jorge Savloff and Marcelo Tenenbaum, is building the 60-unit project at 13780 North Highlands Drive. The seven-story tower was designed by architects Carlos Ott and Frankel Benayoun. Units are priced from the mid $380,000’s. The 60-unit Highlands condo is planned at 13780 North Highlands Drive in North Miami Beach.